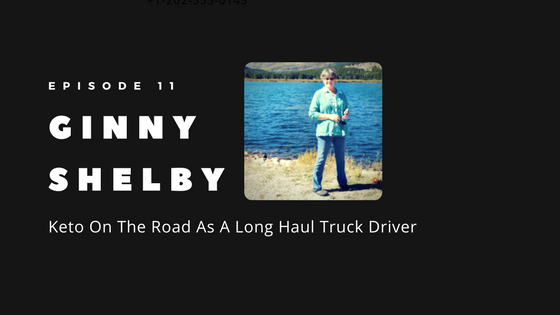 Ginny Shelby is now a retired long-haul truck driver who experienced a complete health transformation after teaching herself to eat keto on the road, from the cab of her semi-truck! Listen as Dave Korsunsky talks with Ginny about how she was able to manage keto on the road and track her statistics with Heads Up Health while she lost 85 pounds and reversed her symptoms of pre-diabetes, diabetic neuropathy and plantar fibromatosis in the process! Starting the keto diet in Feb of 2016 she has been able to attain and maintain her goal of lowering her A1C, and daily blood glucose readings in addition to her incredible weight loss. Initially motivated by a genetic predisposition to diabetes and heart disease, her health transformation extends further than just disease avoidance. Now, both she and her husband are retired from driving and living on the Oregon coast. They continue to eat a ketogenic diet and track their health status with the Heads Up Health tracking app. If you’ve considered trying a ketogenic diet and felt like you just couldn’t manage it with your busy life, then you need to hear Ginny’s story about how she had a Keto Lifestyle Transformation while on the road. Ginny is a great example of the saying “when there is a will, there is a way”.